Keep in mind that this is just a preview using a Wargame and not the final product. Keep in mind that this is just a preview that uses a Wargame, of a battleground that was not meant to be tested during this patch, and is not the final product. The default tooltips now contain the faction of other players, allowing you to see if the unflagged Pandaren are Alliance or Horde. This can be augmented with the various unit frame addons to make it easier to tell which faction a Pandaren belongs to. The Human character selection screen has been updated once again! 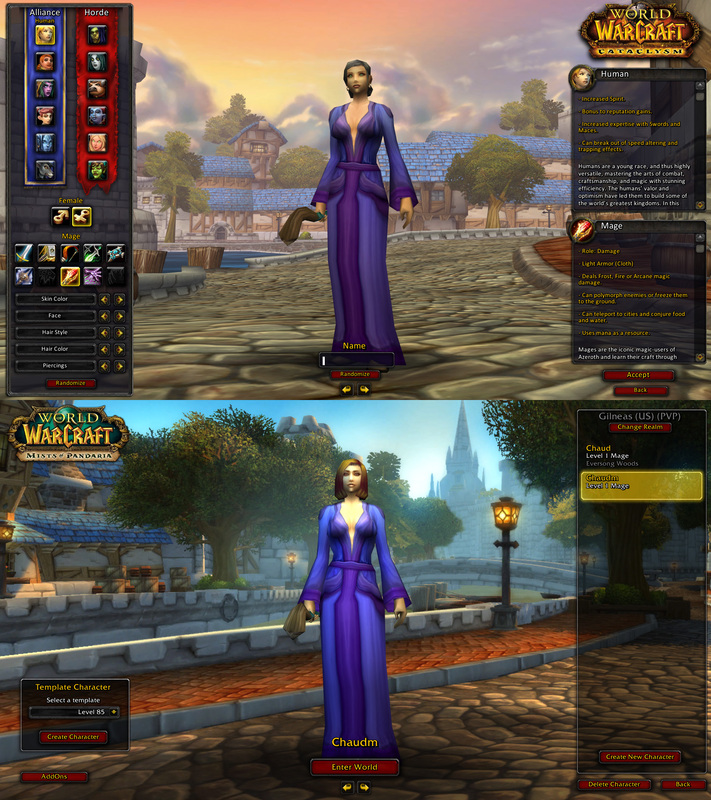 This time it was just smaller tweaks, as you can see with the previous two versions. Because it's boring. Why not make switching from Frost to Unholy spec be purely cosmetic since that would be easier to balance too? We like that dual-wield (for any class) feels faster and that frequency of auto attacks influences your overall rotation. It adds interest for a DK who wants to try something else. It lets a player wonder if that shiny new axe that dropped is worth swapping to a different rotation or not. Besides, single-minded Fury warriors probably have "the best execute in the game by a fairly large margin." The Daily Blink proposes a different type of inspection update! I like the differentiation of Horde and Alliance in tooltips. The dailyblink was also quite funny. lol Nice i like it ! First daily blink I didn't like, you can't be clowning Warriors like that! 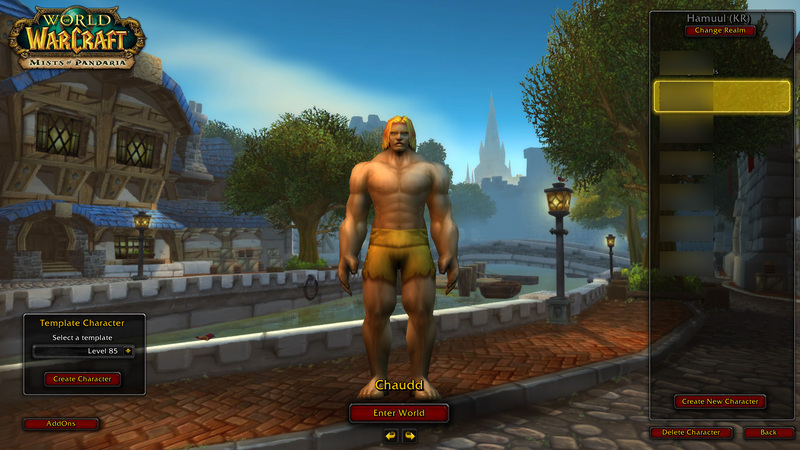 It looks like the only real change to the human character screen was moving the character to left a bit, which means the toon will now stand on the sidewalk instead of playing chicken with traffic. Love the latest TDB, by the way. If anyone can say what bosses really needed an ability like desecreated ground or remorseless winter please say because atm I cant think of any where those abilities would be an immense help. SilverShard Mines is the most, confusing bad example of pvp right now. If that doesn't get reworked ( yes i know it's beta) to about 1-2 carts being pushed. honestly, so far all i see is, 1). you don't have to push the cart just get it to your factions color, 2). track switching has really no benefits besides faster drop offs of resources. 3). no attacking or defending. all it is, is another zerg map. where people walk by n let the cart move on it's way. They need to look at the payload maps from Valve and rework their silvershard mines. 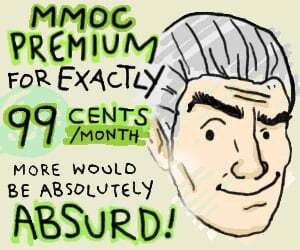 or else it will be, IMO, the fastest blacklisted BG when it releases. Are you kidding me, of all the things to reply to, a blue replies to a thread about ranged weapon visibility. "Adding a Death Rune cost to some abilities is an elegant way to allow all 3 specs to fit an attack into their rotations"
I guess that depends on how you would define "elegant." For me it's just another thing I have to pay attention to in a fight, adding to a rotation that already feels somewhat muddled, as oppose to Dk play in Cata, which to me at least, felt more intuitive and in control with Blood Tap. Now, if I want Blood Tap I have to, on top of everything else, pay attention to some stupid blood charges that don't even appear on my screen :S Uggh.... Here's hoping Dk play mechanics are slightly improved come release time. 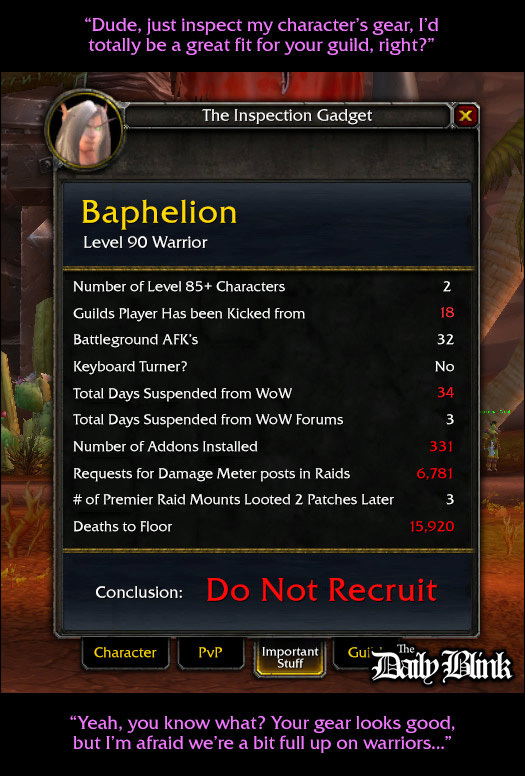 The Inspection Gadget is missing "# of items ninja'd"
Did anyone else not read the "Level 90 Warrior" and just presume the daily blink was talking about a paladin? The same daily blink again? What does farming old mounts have to do with anything? I appreciate that Nik might want to go in blind, but that doesn't mean the quality of the videos posted on the main page should suffer. Perhaps get someone else to do them, or get Nik to record videos after he's gone in blind, had his fun and done some small research.